Our comprehensive range of actuators enables us to automate virtually any manually operated valve using pneumatic or electric power. 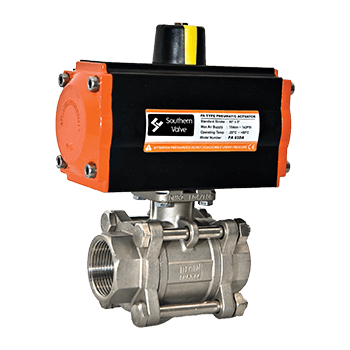 Available from stock is a complete range of actuated valves, specifically suited to your application. We have access to the best products in the industry, giving all of our customers the best-tailored solutions ensuring years of trouble-free service. Trust our team of specialists to create the best actuated valve package for you. Valves are assembled to your specification, rigorously tested, and serial number traced. Pneumatic Double Acting rack and pinion quarter turn actuators. Air pressure to open, air pressure to close. To suit a wide range of ball and butterfly valves. Pneumatic Spring Return rack and pinion quarter turn actuators. Air pressure to open, springs to close fail-safe. To suit a wide range of ball and butterfly valves. To complement the range, options for pneumatic actuators include switch boxes, Namur solenoid valves, and positioners. Electric Actuators motorised quarter turn actuators where compressed air is not available. Options include battery back up for fail-safe operation and positioners.